A storm on March 5th brought Colorado’s first dust-on-snow event of WY2017 (D1-WY2017). Winds up to 100 mph were recorded in the San Juan Mountains. The preceding months experienced a large number of high wind events, but the March 5th event contained the right elements to mobilize dust in the source area and transport it to the Colorado Mountains. From March 13-14 CODOS personnel toured our 11 sample sites around the state documenting the presence/absence of dust. Dust was observed at 7 CODOS sites, following a general south to north gradient of moderate intensity at SASP, Wolf Cr., Spring Cr., Park Cone, McClure Pass, Hoosier Pass, and Loveland Pass. Dust was not apparent at Grand Mesa, Rabbit Ears Pass, Willow Cr. Pass, and Berthoud Pass. With the continuous dry, warm, and sunny conditions since March 5th, and the forecast indicating more of the same, combined with D1 being located on the surface of the snowpack increasing the absorption of solar radiation, sets up the conditions where the snowpack has experienced accelerated warming and melt, which will continue until the next chances of precipitation and cooler weather arrive. SNOTEL station snow water equivalent (SWE) data indicate major basins in Colorado are still in the “High” category, as defined by the CODOS Dust Enhanced Runoff Classification (DERC “Average” equals day median +/- 10%). For gauging stations that are active this time of year, streamflow is showing an early season uptick in response to the last ten days of sunny/warm conditions. In the southern part of Colorado some streams are running double their median discharge for this time of year, with two stations (Dolores at Dolores, San Juan at Pagosa) showing flows close to 4 times their normal rate. We are now moving into the March/April/May dust-on-snow season with one (D1) dust-on-snow event being observed so far at the Senator Beck Basin site at Red Mountain Pass, and at 6 of the 10 other ten CODOS sites during the March 13-14, 2017 circuit. Similar to a few previous years, the spatial extent of dust is taking on a south-north gradient, being more intense in Southern Colorado, and less intense (or non-existent) in Northern Colorado. Where dust exists it is primarily of moderate intensity. The locations where dust is not apparent is Grand Mesa, Rabbit Ears, Willow Creek, and Berthoud Pass. March 1 SWE: First, the abundance, or lack, of snow going into spring factors into when the snow melts, how fast it melts, and total volume of snowmelt. Dust Intensity: The more dust events, and the more severe the dust events, when exposed on the surface of the snowpack increases the absorption of solar radiation, greatly influencing the timing and rate of snowmelt. Spring Weather: A wet spring, along with reduction of incoming solar radiation from cloud cover, curtails dust exposure with frequent snowfalls, restoring high albedo to the snowcover, and largely postponing effects of dust until later in the runoff cycle. A dry spring results in longer periods of dust exposure at the snowpack surface, lowering snowpack albedo and increasing absorption of solar energy for prolonged periods, accelerating the runoff cycle. So far this season we have seen only one dust event (D1) of moderate intensity. The March 5th storm that brought this wet (occurring with precipitation) dust event was the last storm we have received. Since then, dry, warm, sunny conditions have been persistent. Combined with D1 located at the surface of the snow, has added to the absorption of solar radiation, and accelerated warming and melt of the snowpack. As mentioned, D1 was not observable at our northern sites, while dust was very visibly evident at all of our southern sites. Below is a visual output from the NOAA produced HYSPLIT Model (http://ready.arl.noaa.gov/HYSPLIT.php). This figure indicates air mass trajectories ending at three of our study sites for the 12 hours prior to the arrival of D1. Park Cone, where dust was observed is the farthest south of these locations and it’s associated track is indicated by the yellow line. The blue line leads to Rabbit Ears Pass and the green line leads to Berthoud Pass, both locations where no dust was observed during out CODOS Tour. The figure clearly shows a capability long-range high elevation transport from our dust source areas impacting the Park Cone site, while the other two sites are experiencing the effects of lower elevation winds and more local shorter-range transport. The Rabbit Ears trajectory also shows the effects of terrain funneling where it jogs to the north then back northeast while maintaining ground level elevations. Because the length of time for this simulation is fixed for all three tracks, a longer trajectory indicates higher wind speeds along that path. Full-depth snow profiles were performed at all eleven CODOS sites from March 13-14, documenting the presence/absence of dust-on-snow. 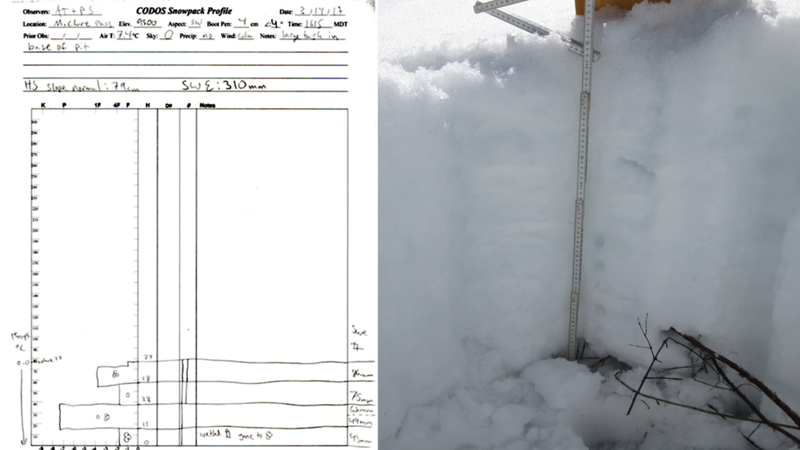 Measurements including SWE, snow depth, wetness and mean (bulk) density of the snowpack at these CODOS sites also assist with verification of conditions as reported by their nearby SNOTEL stations. A brief statement of snowpack and dust conditions at each CODOS site is provided below. These profiles also document the remaining cold content of the snowpack as spring approaches. One CODOS site (McClure Pass) has an isothermal snowpack at 0.0° C throughout, and another (Wolf Creek Pass) is very near isothermal (see table below). March 2017 snowpack temperatures are similar to March 2014 and 2016 conditions, but 2017 data was collected 1-2 weeks earlier. In general the snowpack of Colorado’s mountains is robust and just beginning to transition from wintertime to springtime quality snow. Sites at higher elevations and higher latitudes are still exhibiting wintery conditions while lower latitude and/or elevation sites are progressing towards an isothermal spring snowpack more rapidly. This process may also be accelerated by the presence of dust at our southern sites. Mean measured snow temperatures, by CODOS site, in March for years 2013-2017 from snowpack profiles. Temperature measured at 10 cm (4”) intervals from the ground up. Swamp Angel: Dust observed throughout the landscape, D1 is a moderate event which occurred March 5, and is located on or near the snow surface. SWE = 24.9. 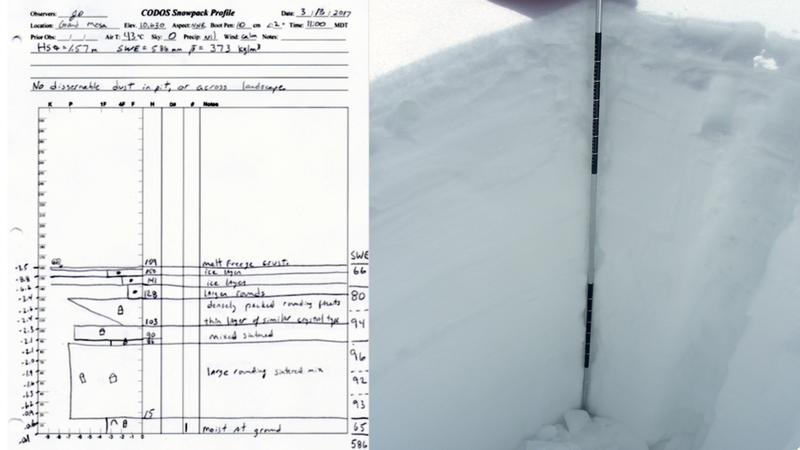 Snowdepth = 6’ (1.85 m). Park Cone: Dust observed. Moderate dust noted across surrounding landscape, emerging most on easterly aspects. SWE = 17.0”. Snowdepth = 4.4’ (1.34 m). Spring Creek Pass: Dust observed. Thickest dust observed on tour, evident on landscape of most aspects, still hard to see in pit face. SWE = 12.0”. Snowdepth = 3.5’ (1.07 m). Wolf Creek Pass: Dust observed. Very deep wet snowpack, trending toward isothermal but not there quite yet. Dust visible with possible leeching seen in deeper layers. Much of the snowpack slightly wetted. SWE = 36.5”. Snowdepth = 7.8’ (2.37 m). Hoosier Pass: Dust observed. Snow is extremely wind affected. Dust evident in lee/sheltered areas, not visible in pit. SWE = 16.1”, Snowdepth = 3.8’ (1.16 m). Loveland Pass: Dust observed. Dust visible on surface on east through south aspects. SWE = 23.3”, Snowdepth = 5.6’ (1.72 m). Berthoud Pass: No dust observed in snow profile or throughout the landscape. SWE = 19.8”. Snowdepth = 4.7’ (1.44m). Willow Creek Pass: No dust observed in snow profile or throughout the landscape. SWE = 16.9”. Snowdepth = 3.8’ (1.16 m). Rabbit Ears Pass: No dust observed in snow profile or throughout the landscape. SWE = 24.6”. Snowdepth = 5.6’ (1.72 m). McClure Pass: Dust observed. Dust present in pit and across landscape. Very little snow at lower elevations. Paonia area is dry. Snowpack is isothermal and consistently wetted. SWE = 12.2”, Snowdepth = 2.5’ (0.77 m). Grand Mesa: No dust observed in snow profile or throughout the landscape. SWE = 23”. Snowdepth = 5.2’ (1.59 m). Close up picture of the snow surface at Spring Creek Pass in the San Juan Mountains. The disturbed snow reveals clean snow under the surface, highlighting the dust on the surface and illustrating the difference in albedo. 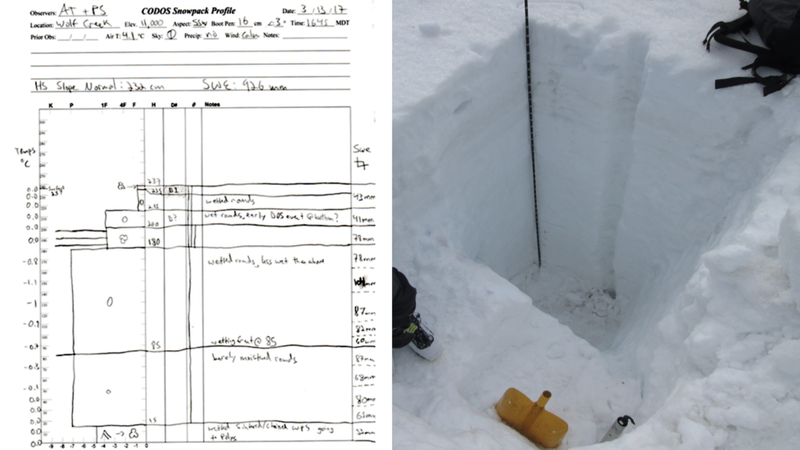 Andrew Temple showing off the 7.8’ (2.37 m) snow pit at Wolf Creek Pass. A filled in pit at Grizzly Peak (near Arapahoe Ski area) helps illustrate amount of dust on undisturbed snow surface. In the March 1st Update all of Colorado’s major river basins were well above median SWE for the date. Since then, even with recent warm weather statewide and little precipitation, the state’s basins are still in the very healthy SWE range. While declines in median SWE have been observed in all major river basins, Colorado’s mountains continue to be characterized by a deep snowpack with significant amounts of water stored as snow. The basin-scale SWE plots shown below aggregate all SNOTEL sites within their respective watersheds and project the non-exceedance probabilities of future snowpack formation and ablation in those basins, based on historic data. Similar projection plots are presented on CODOS site webpages for the SNOTEL stations associated with those sites. With SWE reductions in our greater basins, it’s not surprising that all of our monitored SNOTEL sites have seen reductions in SWE. These reductions have been from 2 - 22% based on median SWE for the date. On a positive note, all of the SNOTEL sites we use in our DERC watershed classifications are still considered “High” except for Berthoud and Rabbit Ears which are “Avg” compared to median values. Overall, Colorado’s major river basins and smaller sub-watersheds are generally healthy from a snowpack standpoint moving into spring. If our temperatures remain high and precipitations continues to be sparse, SWE reductions on the basin and sub-watershed scale will continue to decline and runoff will increase. These conditions will be amplified with the current and any additional dust loading to our snowpack. While stream flow is variable statewide, most areas of the state are seeing average or above average discharge for the early season. Rivers and streams originating in the Southern Mountains are experiencing the effects of significant warming and sunny weather in their basins. Many rivers originating in the San Juan Mountains, such as the San Juan, Animas, San Miguel and Dolores, are currently showing significant spikes in discharge and are running at well above their median flows for this time of year. While these spikes are well coordinated with a regional warming trend, they also coincide closely with the emergence of our first recorded dust event of the season. Additionally, because of the warmer temperatures in the region these are also areas where river ice is more consistently melting out, allowing for higher quality discharge measurements to be taken. Many still-frozen sites have not yet begun automated discharge readings for the season, while many others are reporting patchy and low quality data due to the presence of ice. Rivers in the Northern and Central Mountains that are currently reporting discharge are mostly hovering in average ranges with fewer spikes. This is likely due to either cooler and snowier late winter, less solar radiation intensity, or less dust deposition in these parts of the state. Most likely a combination of all these effects. While we have only recorded a single moderate dust event for the year, additional dust would continue to accelerate melting in the snowmelt driven watersheds of Colorado. With generally well-above average SWE statewide and continued drying in the dust source regions of the Desert Southwest, we have the potential to see significant dust-forcing related discharge. This would be a worrisome condition from a flooding perspective. With the NOAA Climate Prediction Center predicting reduced chances of precipitation and continued warm temperatures (see below), it is a possibility we might see a “dry spring” and the resulting implications on the snowpack unfold. Both the one-month and three-month (not shown) forecast calls for decreased chance of precipitation and increased air temperatures. Above normal air temperatures persisting for the remainder of the snow season is easy to believe since Colorado has experienced above average temperatures over the last three months, and beyond (see below). February was on average 6.7° F warmer than normal, the second warmest February on Colorado’s record (http://wwa.colorado.edu/climate/dashboard.html). CPC’s Seasonal Drought Outlook (below) for February 16 - May 31 indicates the eastern half of Colorado remaining in drought while the western half being drought free. In our March 1st SWE Update we used the DERC model for WY2017 to classify watersheds by either “Low”, “Avg”, or “High” March 1 SWE domains. All major basins fell under the “High” category, and all SNOTEL stations we monitor except for Rabbit Ears (which was “Avg”) was categorized as “High”. Since then, the last ten days have been dry and warm, but all major basins are still considered “High”. With one dust-on-snow event so far this season, anything can happen, it is still too soon to firmly classify dust events as either “Min”, “Avg”, or “Max” Dust. Previous years that received the first dust event within two weeks as WY2017 finished the year with 4 to 11 total dust events. CODOS will identify prior season hydrographs that best compare to current conditions as dust and spring precipitation conditions unfold.